While the jewelry cabinet is coming along, I started on another build this last week of a small danish-inspired bench with a drawer. After the client and I settled on a design, I felt the best construction would be shop sawing my own walnut veneer to minimize wood movement and allow for captured panels in the sides. 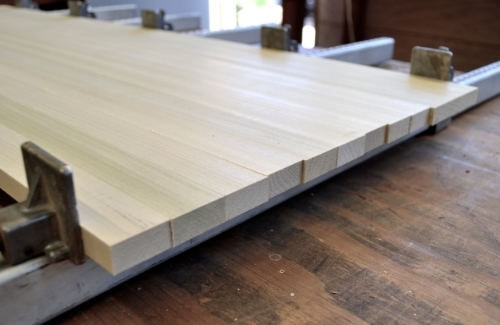 Starting off making the substrate, I milled up some flat sawn, 5/4" poplar and began gluing them up to be squared and re-sawn to 1/2" thickness, and then again surfaced to a thickness of 7/16". Below you can see the re-sawn sections being glued up a shade wider than the finished width of the top. This first layer of poplar then gets cross banded with a layer of 1/16" poplar veneer. This begins the process of "locking" in the grain to almost eliminate the seasonal movement. This is also what will allow the two side panels to be captured tight inside of the square base. Below, the first two layers of the substrates are glued together using the vacuum press. With the substrates complete, I began going through the walnut and selecting the cleanest vertical grain for the top and selecting the rift sawn for legs and the drawer front. Lots of good wood to choose from! After the veneer is cut to about 3/32" on the bandsaw, I started work on the layout and edge-jointing of the veneers. Pretty straight forward, but one of the more enjoyable tasks in the build. Anytime I can use a plane for a few hours it is always a good time, and jointing them by hand instead of gluing them up straight off the jointer is the only way to get an invisible seam...way better! After the veneers were together I moved on to adhering them to the substrates...same process, back in the vacuum press. To get a better look at what this type of construction looks like after it's all said and done, below is an older sample showing a corner removed. 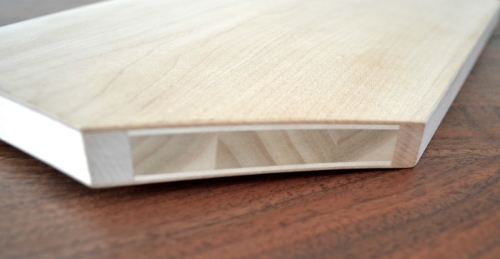 You can see the individual staves in the middle, the 1/16" cross-banding, and then the final show veneer on the outside. So I'll wrap this post up with a shot of where things are - legs and sides milled up, the top and bottom out of the press and ready for edge-banding.